It isn't so much that either the Liberals or NDP increased their support, but that the Green lost support. The Liberals ran a strong candidate in Nanaimo. Appears to be a well-known and solid citizen. There will be candidates from all parties that do not run in next provincial elections. They have done their time and want to move on to other things. The Liberals will do better in next election with some new faces. The public is tired of the shenanigans of some of those from Christy Clark days, as they are with some of the long-term NDP. baron1963 wrote: l and liberals are not corrupt. .
Have you been living under a rock for the last decade ??? You can't really be serious ??? baron1963 wrote: If you look at Kelowna employment numbers the largest percentage of workers are in healthcare and social assistance. Education services also garners significant employment. Many of these individuals would belong to public unions, yet we are a liberal stronghold. 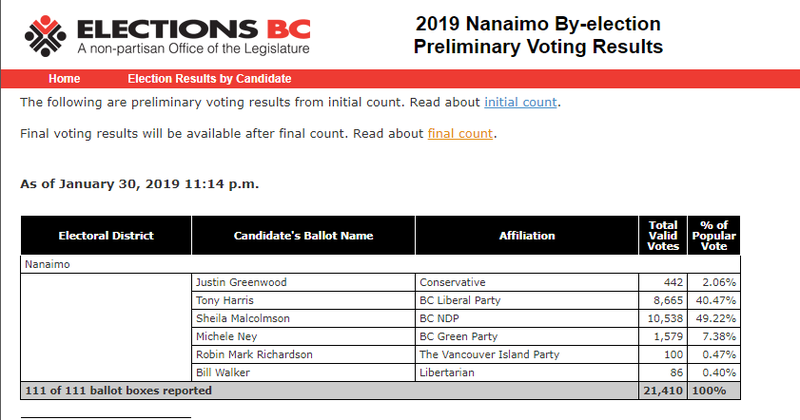 I think we need to give credit to NDP for holding onto this seat, I honestly thought it would swing to liberal given that Nanaimo is subject to the speculation tax. Calling a party stupid, it’s candidate crazy and the voters boneheads does not help the liberal cause. Just got back from Nanaimo and from my own personal experience, they are not boneheads but have different ideological preferences when it comes to provincial politics. Likewise, Wilkinson is not a weasel and liberals are not corrupt. Yes, there are some bad apples in both parties but they are not representative of the majority. Do those numbers take into consideration, the large portion of construction industry related types, who are self employed? Piecemaker wrote: It isn't so much that either the Liberals or NDP increased their support, but that the Green lost support. The Liberals ran a strong candidate in Nanaimo. Appears to be a well-known and solid citizen. To Urbane Cowboy - the numbers I quoted are based on the number of people working in an industry so this would include both self employed and working for an employer. Some in the healthcare and education services would also be self employed. Eg. doctor running his own practice, teacher offering tutor services, etc. My point is that we have to do a better job in attracting unionized workers to the liberal side rather than using that as an excuse for losing this by-election. baron1963 wrote: To Urbane Cowboy - the numbers I quoted are based on the number of people working in an industry so this would include both self employed and working for an employer. Some in the healthcare and education services would also be self employed. Eg. doctor running his own practice, teacher offering tutor services, etc. My point is that we have to do a better job in attracting unionized workers to the liberal side rather than using that as an excuse for losing this by-election. No argument from me there, but that is a BIG ask, considering how good unions are at brainwashing the rank and file. A piece of data that I think would be interesting to know, is what percentage of the elderly voter population, votes for the NDP in Nanaimo, versus Kelowna? As to those "rats," I would suggest that party renewal is a good thing and not a bad thing. Here we have the NDP government with many of the same characters that were running the show during their disastrous time in office in the 1990s. Not good! I said long ago that it was time for people like Rich Coleman to exit the stage and it appears as if he and De Jong are doing just that. Some weeks ago, during a discussion of the controversy that Plecas initiated with his amateur hour investigation, I suggested that an early election wouldn't be good for the Liberals. Horgan needs time to hang himself and he's in the process of doing just that. Accordingly, the NDP win in Nanaimo yesterday is a blessing in disguise for Andrew Wilkinson and the BC Liberals. It was indeed interesting to see the much higher vote % for the Liberals coupled with falling support for the Green* party. We know that the Liberals lost votes to the Green* party as a "protest vote" last election. Nanaimo was an 8% of the vote gain for the Liberals and a 13% loss of votes for the Green* party. The NDP picked up 2.5% vote share. I would suggest that Liberals who were upset with the CC brand/direction "came home", and NDPers who were upset with the NDP did as well. Dangerous to extrapolate, but is interesting to wildly speculate on what effect that would be based on the last election. A net gain of 5.5% for the Liberals over the NDP (the Green* party is irrelevant now that PR went down in lames). That would swing 3 seats minimum to the Liberals (plus the Plecas seat - he will be toast) which would bring the Liberals to 46 seats. 46 seats would make NDP-Green* shenanigans irrelevant. That doesn't count the 7 swing seats the NDP won by a margin of more than 5.5% (largely due to now broken promises). "Sticky fingers" Horgan and crew are fading fast. Lots of time to go, but their record is smoldering and not going to get any better. 2019 is shaping up to be a slow economic growth year. Many NDP "promises" are falling flat on their beaks. I would simply add that after double checking statistics, using the phrase "Liberal spanking" is also nothing short of an NDP supporter lie. Please note that the above results are incomplete, until such time as the "final" count is done and officially announced after counting absentee ballots, which hasn't happened. Conclusion - At this point in time the Liberals have actually increased their popular vote number. If anyone is worthy of the term "spanking" though, that would be the Green Party. I look forward to seeing what the actual official final numbers are for this by election, then await a retraction from flamingfingers for posting misinformation. Oh what am I saying............. as if that would ever happen. Yep, and considering that Nanaimo is a "safe seat" for the BC NDP, the Liberals giving them a right royal scare there is not a good sign for the dippers at all. This year the goofiness of BC NDP excuses for policy really starts to kick in. By the end of the year "Sticky Fingers" Horgan and his crew of petty thieves will be in big trouble as their nonsense shows itself clearly to be just costly "tax and waste". hg - you have posted variations of this same theme every week for the past year and some months. ^^ The rational readers need constant reminding to counteract the endless digital influencer misinformation. Keep up the good work hobbyguy. And just a reminder...the Liberals were said to be 13% ahead in the polls. Just a few days before voting. They lost by 9%. That is a stunning 22% turn around. Despite phone in campagns by Liberal MLAs in many other ridings. And the you know what has hardly begun to hit the fan from Legigate. Look for PLecas to join the NDP, shortly. And the Greens and NDP to cooperate even more. As for articles from the Calgary Herald..
Alberta remains totally out of touch with the rest of Canada. A beer in every hand and a handout for every beer! Tick Tock time will tell. Notley may surprise, again. ^^ I seem to recall coming to the end of the 2013 election campaign polls said the NDP were going to win. In fact to read some of the media reports they had Dix crowned already, and we know how that turned out, so what's your point? The only poll that counts is the one conducted in the voting booth, and that won't change. George+ wrote: And just a reminder...the Liberals were said to be 13% ahead in the polls. Most of your post has nothing to do with yesterday's byelection. The one poll to which you refer was an outlier and the BC Liberal share of the vote was way up from 2017. Not down. What will Weaver do now? He lost the PR battle and now he and his party are becoming irrelevant. Might he change course? For example, maybe he'll come to Kelowna and voice support for the replacement of Rutland Middle School. Minister Fleming says that SD 23 has done very well over the years with new schools etc. but that school really needs to be replaced. Just one example. Maybe Weaver could support the Liberal proposals to reform the BC Legislature to clean up the spending issues. How about that? So maybe some changes are coming. The byelection results should be a big wakeup call for Weaver and his party.